My fitness has been sliding for years. There has been the odd burst of enthusiasm from time to time, but it was never successful at getting me back into good habits. It finally got to the point where I admitted defeat and called in the experts. To cut a long story short, i was inspired to contact Vision Personal Training by someone who’s had an incredible life changing fitness turn around thanks to them. I’m now two months into my fitness program and I can say I’m very impressed. I’m feeling much more alive and have shed over 4 kilos and put on some muscle. I’ve never had results like this before, ever. Vision’s program is holistic; they focus on diet/nutrition, exercise and motivation. For me motivation is the biggest issue. As part of the quest to find a goal that would motivate me, I ended up committing to train towards and enter a short “sprint” triathlon. aaaaaaaahh!!! I started running and swimming, but i needed a bike. After a month or more of research and asking for advice, I finally settled on a Cannondale Bad Boy Disc. The next issue was where to buy from. As I work in Sales now, I know a lot of the tricks salesmen play. I visited several shops, wrote most of them off for bad service, biased/bad advice or hard sell BS. I found a shop nearby that managed not to do anything wrong. They even gave me some excellent advice on shoes and pedals. amazing. I wasn’t able to haggle them down much on price, but considering the good service, i didn’t push it too much. Today I picked up the bike, got it home, figured it all out and took it for a short spin. It’s pure sweetness! very impressed am I. The accessories are awesome too (great advice). I dug through the boxes down in the garage and found all my old MTB clothes (from a fitter time long ago). Some were no good anymore, but most were just fine after a good wash.
woot! It’s going to be fun whizzing around town. Your first bike will never be the bike you end up wanting later. It’s impossible to predict the direction your interest will go. I ended up deciding to get a good commuter bike; 1/2 fashion, 1/2 logical choice. I picked flat bars over road bars as i’d rather have easier hill climbs (stand up, rock the bike side to side) and steering over speed. the bar ends give me more hand positions (which is a reason to get road bars). I’m not going to race on this bike (if ever), so wind resistance (drag) from a more upright body posture isn’t an issue. I chose to do without suspension. 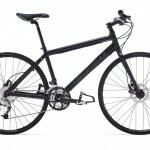 i’ll be riding around urban areas so i dont really need it. also, suspension is more weight to haul around and more moving parts to go wrong. cheaper without too. Triathlon bikes look the way they do to enable the rider to be in a more face down position. This takes load off some key muscles needed for the run. As a result of this position there is more weight on the arms which explains the need for the “tri bars”. Cyclocross people have a reputation for being more crazy than your usual cyclist. I have no idea why this is. Cyclocross bikes seem to be tougher versions of road bikes, with knobbly tyres. Put money into a good seat/saddle. I’ll be upgrading mine soon I think. To me, strap in pedals seem suicidal. i didn’t even try the ones that came with the bike. get clipless pedals or just use flat platforms. I discovered the Crank Bros “eggbeater” pedal. The mechanism is simpler than the Shimano style ones. hooray for low maintenance! UPDATE: 22 Jan 09 – had my 9 week fitness test. 3.2 level improvement on the “beep” test (to 10) and 7% body fat reduction. go me! UPDATE: 18 Feb 09 – another fitness check. another 2% reduction in body fat percentage. I bought a Rocket V saddle on ebay for about $50. score! tried it out on the weekend, rode 35km to Randwick and back. This is an awesome seat, two thumbs up from me. I was in Randwick visiting Cheeky Monkey to talk to them about triathlon clothes. I picked up a vest and shorts and wore the shorts back home. Man, what a difference. the MTB shorts i was wearing just weren’t suitable for road rides. they got too hot and moved around too much. I was surprised at how comfortable the shorts were considering they’re tri-shorts, not dedicated cycle shorts. UPDATE: 20 Mar 09 – another fitness check. body fat percentage down some more, 3% this time (~12% since i started last year). another level up on the beep test, to 11. Good for you, Daniel! I work with a half-dozen iron-persons (male and female), and my brother-in-law does full Iron Men (trying to qualify for Kona!). 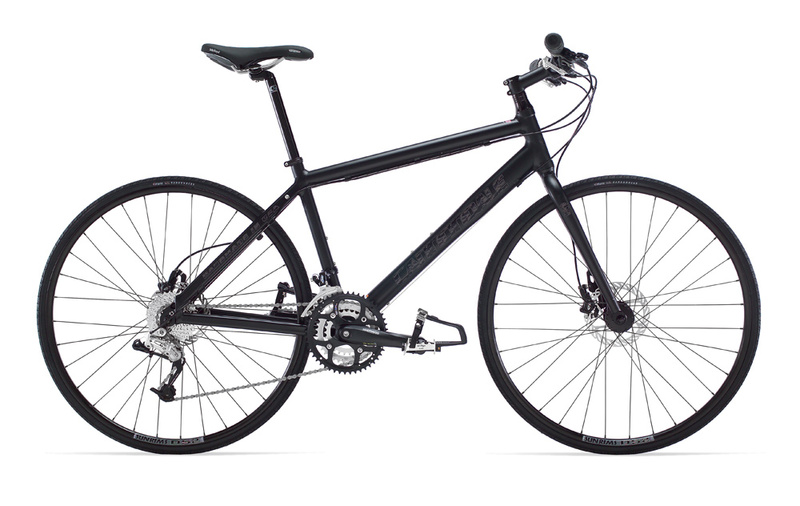 I bought a bike last year, going with the Trek 1.2 road bike. First major thing I did is get rid of the toe cages and replace them with Shimano SPDs. Congrats on getting out there! Me, I’m working on a solid training regimen that won’t lead me to a triathlon, but will get me to a 100mile bike ride this year. I added a Gary Fisher hybrid to the stable of bikes @ Saunderson Inc (North America Division), but it’s nowhere near as nice to ride as my Trek.